The fourth chakra is situated in the centre of the chest around the area of the heart and is represented by the green Anahata Mandala (un-struck sound), symbolised by four legged mammals. The higher 3 chakras relate to the self within the collective conscious of higher guidance and the lower 3 chakras relate to personal energy. 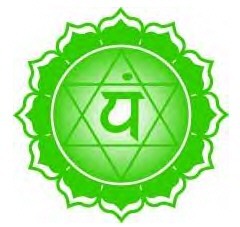 The heart chakra is the area where the other 6 chakras converge and this is the foundation of the astral body – the connection between our spiritual and physical body, this centre is driven by love. The heart chakra influences compassion, forgiveness, empathy, equilibrium, trust and ease within your life. This centre connects you to the plant world and helps you get in touch with nature. The heart chakra influences physically the lungs, circulation, thymus and the immune and endocrine systems. Too little flow in the heart chakra is due to a lack of balance in the first 3 chakras. Imbalances within this chakra can cause an emotionally unstable feeling, causing you to play the martyr or become obsessed, suspicious, or to feel unloved and also cause you to repress things. When this chakra is in harmony and balance with the upper and lower chakras, it allows for unconditional love and in turn allowing us to help those around us. You will feel at peace with yourself and the world around you. The heart chakra aids in rebirth, rejuvenation, success, prosperity, growth and development -bringing balance to every part of your being. In turn you’ll enjoy helping others and will become a humanitarian. The Pelvic thrusts and Cobra Pose are good yoga poses for healing this area. Bikram Yoga – By simply opening your heart to others you will open up the heart chakra. Any green foods like spinach or leafy vegetables. Include fibre and grains like whole wheat bread and like granola in your diet. Drink yummy tea like green tea. Rue (Ruta Graveolens) and Saffron (Crocus Sativus, Crocus Saffron). Emerald, malachite, pink and green tourmaline, green jade, chrysoprase, green aventurine, kunzite, rose quartz, fluorite, ruby and moldavite.